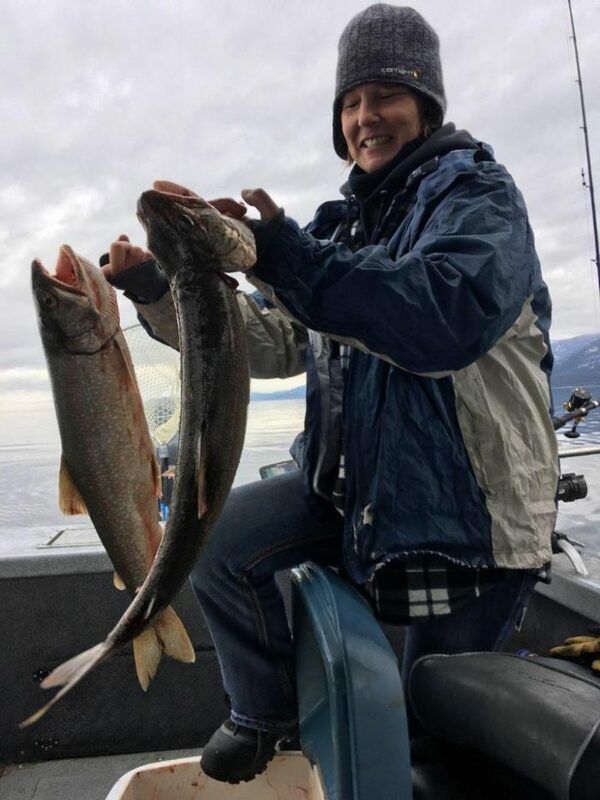 Julie Perkins of Kalispell with two lake trout entries. The 2018 Spring Mack Days Fishing Event is just about half way over with twelve days of weekend fishing completed and five weekends to go. A total of 15,924 entries have been turned in compared with 17,319 in the 2017 Spring Event. Unsettled spring weather has hampered the anglers with winds, cold, snow, rain, rough water, hail, and ice. Friday was very cold with ice covering everything on the south end of the lake in the morning. Anglers could not launch on the water until after noon. The north half of the lake was a little better and some anglers were able to bring in good numbers. A total of 586 entries were turned in on Friday. Saturday was the nicest day of the weekend with 1,311 entries and Sunday a total of 1,045 were entered. The weekend total was 2,942. Up to $225,000 in Cash and Prizes sponsored by the Confederated Salish and Kootenai Tribes will be awarded on May 13th. Anglers can fish Tuesday through Thursday for bonus amounts, tagged fish, and special $50 drawings. Friday through Sunday anglers can fish for all of the special categories, bonuses, lottery drawings, and tagged fish. Entries continue to be taken until the last day and there is no entry fee. All it takes is one fish to win in the lottery drawing. Go to www.mackdays.com for information or telephone 406-270-3386. The $10,000 tagged fish is still out there. There is also 3-$5,000, and 5-$1,000 tagged lake trout plus over 6,000 with values from $500-$100. Jason Mahlen and Sam Cusker each turned in $200 tagged fish over the fourth weekend. Turning in $100 tags were Kalispell anglers Terry Krogstad X 2, Julie Perkins X 2, Bob Stewart, Bob Turner X 2, Travis Banyai, Jason Mahlen, Sam Cusker, and Darren Borgen. Julie Woolley of Manteca CA also had a $100 tagged fish. Weekend winners of $100 were Kalispell anglers: Gene Corne, Bob Turner, Jason Mahlen, Andrew Reed, and Ken Varga. Winning weekend tickets are drawn on Sunday after all anglers have turned in. The drawing is done and witnessed by other anglers or staff. After four weekends of fishing Friday through Sundays on Flathead Lake-Jason Mahlen of Kalispell and Mike Benson of Lonepine are tied for first place with 870 entries each in the Top Ten Angler Category. Jason made his move over the weekend turning in two 100 fish days on Friday and Saturday and then was blown off the lake Sunday with a total of sixty five. He came in second in 2017 behind Danner Shima, and was 1st in 2016, 2015, 2014, 2013, and 4th in 2012. Mike turned in 44 on Friday, 35 Saturday, and 67 on Sunday. Benson is more of a Fall Event Fisherman winning 1st four times and has been in second place in the Spring Event three times over the years, third twice, and in fourth five times. Every day is different on the water and all of the anglers continue to fish hard to improve totals and averages. Steve Benson of Spokane Valley, WA is in third with 662-10, 48, and 32, 4th Sam Cusker of Bigfork with 611-35, 40, and 44, 5th Felix Gauci of Stevensville 587-28, 41, and 31, 6th Scott Bombard of Missoula with 449, 7th Larry Karper of Florence with 404, 8th David McDaniel of Polson with 386, 9th Kolton Turner of Kalispell with 379, and Travis Banyai of Kalispell is 10th with 351. Totals and placings can change fast. Lake trout limits on south Flathead Lake are 100 per day and on the north half 100 per day under 30” or 99 under 30” and one over 36”. Brandy Hilde of Bigfork continues her lead in the Ladies Category with 233 lake trout entries, Julie Woolley has 126, Julie Perkins-66, Julie Vacca of Missoula-51, and Debbie Paine of Polson-49. Larry Karper of Florence is first in the 70 and Over with 404, Gary Perleberg of Bigfork is 2nd with 180, John Gauci of Florence 3rd with 124, Larry Ashwell of Missoula 4th with 68, and Ralph Johnson of Columbia Falls has 37 for 5th. Tyler Varga continues in the 13-17 group with 291, Rylan Koch of Butte is 2nd with 20, Logan Lang of Kalispell is 3rd with 15, Brandon Paine of Kalispell 4th with 14, and Abby Hodgson of Kalispell is 5th with 13. Matt Guckenberg Jr. of Kalispell is 1st in the 12 & Under group with 199, 2nd Tripp Bick of Arlee with 13 and Brodie Smith of Kalispell with 13, 4th Emmett Ludahl of Kalispell with 4. Mack Days are used as a tool to reduce numbers of lake trout in Flathead Lake and increase the numbers of native bull trout and westslope cutthroat trout. Check out the website for information, entry forms, fish ID, pick up times, etc. All boats in the Mack Days Fishing Event are required to be inspected for AIS before launching in Flathead Lake.